This lovely necklace includes two beautiful carved Burmese jade rectangular cylinders (one capped in 18 carat yellow gold that is set with Tsavorite garnets). Another focal point is a flow knot in light jade, jade beads of varying ages and tones of green, grey-black Tahitian pearls and chrysoprase, prenite and turquoise beads and a bead pave-set with Tsavorite garnets hand-wired on 18 carat yellow gold wire and accented with yellow gold beads and yellow gold ‘S’ shaped clasp. 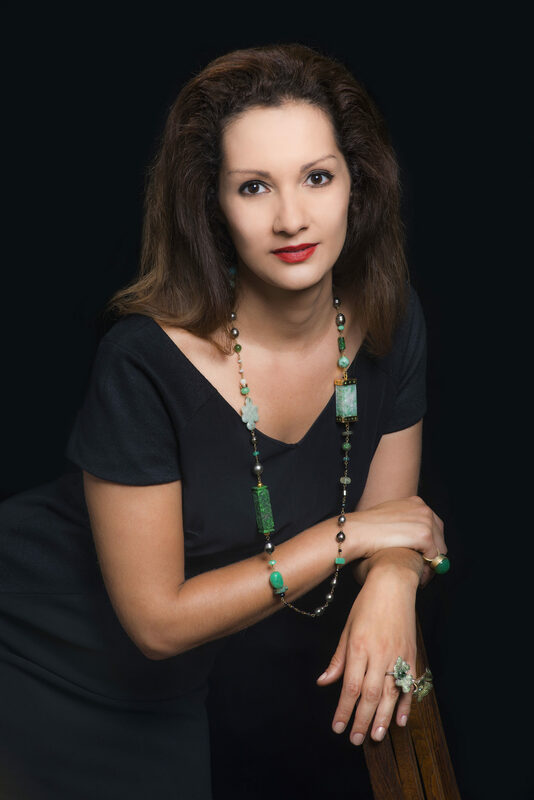 This lovely necklace includes two beautiful carved Burmese jade rectangular cylinders (one capped in 18 carat yellow gold that is set with Tsavorite garnets). Another focal point is a flow knot in light jade, jade beads of varying ages and tones of green, grey-black Tahitian pearls and chrysoprase, prenite and turquoise beads and a bead pave-set with Tsavorite garnets hand-wired on 18 carat yellow gold wire and accented with yellow gold beads and yellow gold ‘S’ shaped clasp. From a general perspective these long green jade necklaces (with black pearls or white) were conceived as an integration of Eastern and Western notions of aesthetics and politics within pieces of jewellery. Eastern (Burmese, Chinese, or Russian jade and white Australian South Sea pearls (or black or silver Tahitians) is attracted to Western style; West is attracted to East. Here Western design, culture and materials: such as Australian white South Sea Pearls, Australian chrysoprase, and opal are integrated with Burmese jadeite and jade cut in China. These gems are worked onto 18 carat gold wire. While there is a cultural element to the choice of stone, by hand-wiring it together it has given it an organic ‘feel’. Green tones (from light to dark green with white or black) are heightened with contrasting textures, sizes and shapes. Australians are (on a daily basis) reminded one way or another of a co-existence (both friendly and strained) with various Asian cultures in the Asia-Pacific region. From a Pre-European perspective, Asians have visited Australia for a longer period than it has been thought. Ancient Chinese and Viking wrecked boats have been found off our northern coasts. Over some centuries, Indonesian fishermen have integrated with Northern Australian aboriginals – impacting on Aboriginal art forms, distinctively more Asian in style than the rest of Australian Aboriginal art. As pearl farming became another developing business in Australia, Japanese and other Asian groups of pearl farmers integrated with the populace in the beautiful Broome region – bringing another dimension to pearl farming to our world famous South Sea Pearls. Pearling is an established part of Australian history and business.